Beater: Frame holding the reed, used to beat the weft threads in place. Cartoon: A drawing in full size used as a “map” for the weaver. Cloth beam: A beam in the back, below the warp beam, that rotates and holds the woven tapestry. 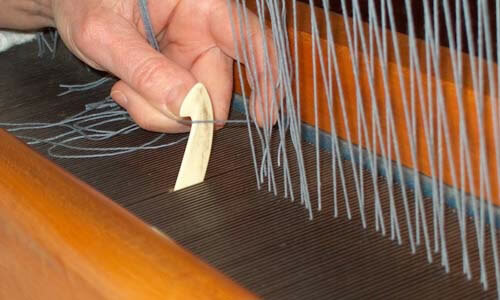 Dent: Narrow spaces in the reed that hold the warp threads in place. Heddles: Loops held by the shaft with eyes for threading the warp through: in conjunction with the treadles they enable the warp to open and close and bind the weave. High-warp loom: A loom with the warp set on a vertical plane. Loom: A structure made to hold a warp in position for weaving. Reed: A comb with both sides closed which sits in the beater below the heddles. Shaft: A frame, with heddles, which moves to form sheds. Shed: The opening created on a loom where the weft passes. Slit tapestry: A tapestry technique, leaving slits where two colors meet. Treadles: Foot pedals used to move the shafts to open and close the sheds. Warp: Threads running the length of the loom, across which threads are woven. Warping mill: A four corner frame that rotates and arranges the threads into the correct length of the warp, and produces the right amount of warp threads for the width of the tapestry. Weft: The threads which are woven under and over the warp threads, building the design in the tapestry. After threading through the eyes of the heddles, the warp threads once again are fed through the reed.